A planned city with streets laid out in elaborate, geometric patterns and founded specifically to serve as the capital of the emerging Australian state, Canberra has a self-sufficient atmosphere. Venture out of the city with trips to Reflections Holididay Parks Burrinjuck Waters (in Burrinjuck) and Canberra Deep Space Communication Complex (in Paddys River). Spend the 14th (Sun) exploring nature at Namadgi National Park. 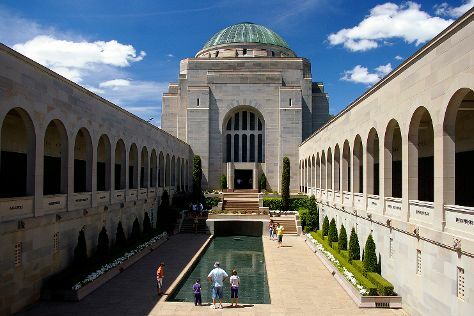 There's lots more to do: take an in-depth tour of Australian War Memorial, ponder the world of politics at Parliament of Australia, admire the natural beauty at National Arboretum Canberra, and explore the activities along Lake Burley Griffin. To find other places to visit, more things to do, traveler tips, and other tourist information, you can read our Canberra attractions planning website . In April, daytime highs in Canberra are 24°C, while nighttime lows are 7°C. Cap off your sightseeing on the 19th (Fri) early enough to travel back home.